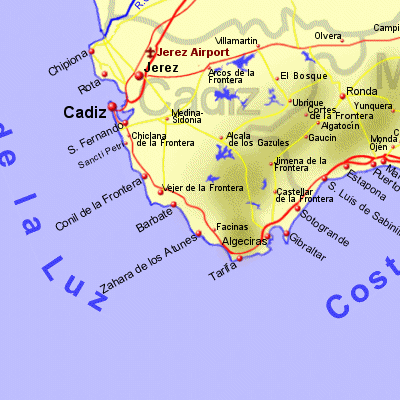 Cadiz, the most southerly of the regions of Spain, has a long coastline on the Atlantic Ocean (the southerly end of the Costa de la Luz), and a shorter coasline on the Mediterranean. The Atlantic coastline is typified by wide beaches of golden sand which can be windy at times, particularly towards Tarifa, at the southern point. These beaches have space for everyone, some being well away from built up areas. Inland you will find typically whitewashed villages, axamples being Vejer de la Frontera and Conil de la Frontera, often perched on a hill. The villages of the area have history going mack to the time of the Moors, with the border of the area of Moorish control running through the province at one time, hence many villages have "de la Frontera" in the name. The capital city of Cadiz has plenty of history. Infact it is believed to be the oldest city in the Iberian peninsular that is still standing, having been founded by the Phoenecians around 1100BC, and became an important city in Roman times. The city stands on a narrow spit of land which shelters the natural harbour which was the starting point for Christopher Columbus and other adveturous sailors of the 15th century. The fastest crossings to north Africa however run from Algeciras, near the southern tip of the province, and across the bay from Gibraltar.